The most important thing to consider when planning your bulletin boards for going back to school is the theme. Begin by choosing something that is age appropriate for the grade level you are working with (like this Vintage Inspired Carnival, which was loved by all of Tami’s previous 2nd graders). You can also plan to incorporate something personal into your theme. For example, a few years ago when Tami was teaching in Arizona, she brought her “home” into her classroom with a star-studded Hollywood theme. Popular current events also make a huge statement (like this A Royal Classroom theme which came after the summer William and Kate got married). Tami has been wanting to incorporate her favorite Dr. Seuss quotes into her theme for a while now, and finally felt like this year was the right time. As Tami is now starting her second year teaching Jewish Studies to 1st – 6th graders, she has the additional challenge of appealing to different age groups. After much planning and preparation, she has managed to select a quote and an overall bulletin board look that is grade level appropriate and works well with the curriculum she follows for that particular class while still staying true to the theme. 1st Grade: “From there to here and here to there, first graders are everywhere” … and so are Jewish things. This year, the first grade class will be learning about their community. In Social Studies, they get a chance to meet and interview many community helpers (such as the public librarian, a doctor, the school’s Rabbi, and even a soccer player). This concept is then brought into Tami’s Jewish Studies class as she introduces them to the Jewish community around them. This bulletin board will serve as a place for her students to brainstorm a list of “Jewish things” they already know coming into this year. 2nd / 3rd Grade: The 2nd / 3rd grade class will be traveling a lot this year (in their learning, that is). Oh, what places will they go? … to meet the prophets of Ancient Israel and modern day prophets, to the temple to lead others in prayer, to a special interfaith food pantry, and even to Jerusalem. The bright neon colors and patterns in this bulletin board will not only introduce these topics of learning to all passers by, but get the kids excited as well for the year ahead. 3rd Grade: “Why fit in when you were born to stand out?” What a great message for third graders to live by each and every day! In this bulletin board Thing 1 and Thing 2 make an appearance to announce the things coming up in Jewish Studies. “Bal Tashchit” (Guarding the Earth), and as the Lorax is known for “speaking for the trees”, he is the best one to help students remember this special value. This month’s Craft Club meeting started out just like any other … girls getting together, catching up on each other’s lives, and of course snacks were involved. Delicious cucumber sandwiches, cheese and crackers, and grapes helped keep us happy while working on our projects. Most of the time, we like to choose a theme for our monthly craft. However, every once in a while we feel the need to get caught up on a particular project or work on something that demands immediate attention, which allows everyone a chance to show their creativity in their own way. This month’s Craft Club meeting was extra special in that two of our members had projects to work on and their sisters decided to lend a hand. Sisters, Paige and Whitney had “sew” much fun working together to create bright and cheerful throw pillows (with an amazing ruffled trim) for an otherwise all white bed. As for these two sisters working Side by Side … you will have to wait to see our project on Wednesday as we reveal this year’s theme for Tami’s bulletin boards. A huge thanks goes out to Lauren for all of the help she has provided in not only preparing the materials for each bulletin board, but actually coming to school and helping in putting it all up! Guess that’s what sisters are for. We are currently looking for suggestions for a special September craft. Have any ideas? Contact us by leaving a comment below or sending an email to sidebyside.design@yahoo.com. The nights are cooling down and the kids are getting ready to go back to school. The end of Summer is upon us, and although this may be a bit of a bummer for some of us we are still inspired by bright colors and cheerful decor. In honor of the Summer coming to an end, we have prepared an event inspiration post for all of you to enjoy, take ideas from, and create your own end of Summer celebration. As usual, the invitation sets the tone for the event, and in this case coordinates with all of the other printed items for the party. Keeping one look for everything brings it all together and creates a consistent concept. This Summer-y tablescape is casual and formal at the same time. The bright pops of neon create a fun vibe, (perfect for a backyard dinner party) while the gold chargers and wine goblets dress it up a bit. Strands of gold paper circles could be hung from a tree or an exterior overhang for additional party flair. Fresh fruit adds a Summer-y touch to any party cocktail, and we would die to have these gorgeous gold rimmed glasses. Why not make a statement with your cake with a festive table and a bright backdrop your guests are sure to enjoy? 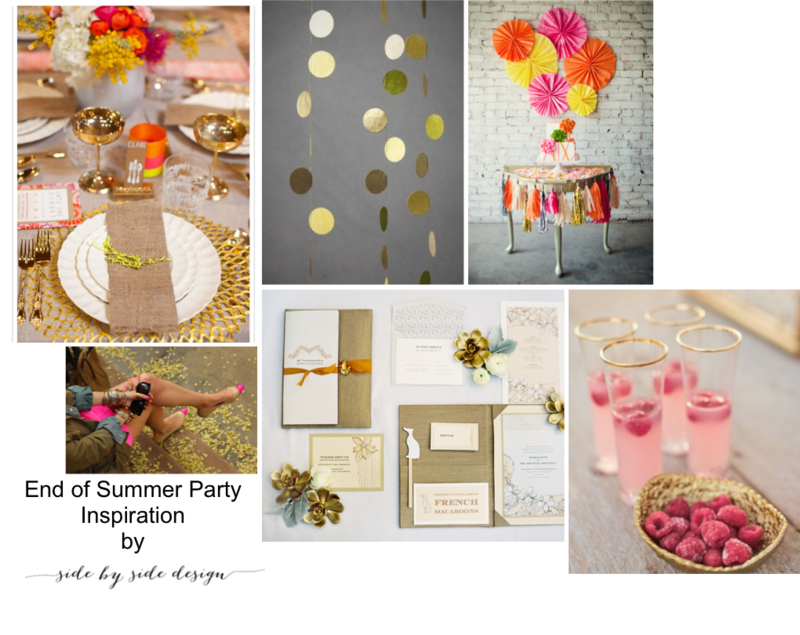 We had way too much fun preparing this bright and cheerful inspiration board for all of you and hope that you enjoyed it as well. In the next few weeks, you may choose to throw an end of Summer party of your own. If you feel inspired and would like our help in planning your next event, we are just an email away. When planning a nice dinner with friends, we have many different options (including all of the amazing restaurants in our area). However, nothing beats a quiet home-cooked dinner in. Last week (for no reason at all), we decided to host a dinner party for a few friends complete with a healthy Italian style menu (seen on Friday’s post: Dinner Party Menu) and a beautifully set and decorated dining room table. Use a tablecloth or special placemats to give your table a different look from the rest of the week. Pull items together to make an eclectic centerpiece. Keep the season and occasion in mind when deciding how to decorate. Cloth napkins and fine china make for a more formal setting. Create a menu mix of old favorites and new exciting additions. Make sure to keep all of your guests dietary restrictions in mind as well as keeping things healthy. Fresh, seasonal fruit is a great alternative to rich decadent desserts, and this delicious fruit salad is no exception. With Summer coming to an end, why not take this opportunity to host some friends in a little dinner party. If you follow these tips you are sure to impress your guests and maybe even yourself. Italian food is one of our all time favorites, but unfortunately it’s not always the most healthy option. When we go out for Italian food, we find ourselves finishing entire bowls of pasta, multiple slices of pizza, and delicious homemade bread (not usually all in one sitting). This week we threw a dinner party complete with an Italian style menu. As we are currently on a health kick and really trying to cut back on carbs, the recipes we used not only fed our cravings for some of our favorite foods but made us feel slightly less guilty. Thank you Pinterest! Italian Chopped Salad: We made this delicious salad without the meat. We also added our favorite dressing; olive oil, lemon juice, salt, pepper, and a splash of oregano. Balsamic Marinated Grilled Chicken: An easy recipe adds flavor to our meal. The leftovers made for a great addition to the salad the following day. Julia Child’s Eggplant Pizzas: This recipe was selected in honor of Julia Child’s 101st birthday, which would have been yesterday (August 15th). We find it ironic that she said, “You learn to cook so that you don’t have to be a slave to recipes.” We honestly want to be a slave to this recipe … it was that good! Red Fruit Salad: Two words … A – Mazing!! All red fruit topped with lemon juice, basil, and a sprinkle of sugar is absolutely to die for! Here is the recipe … you won’t be disappointed! When planning your next dinner party, stick with your favorite cuisine but throw in a healthy twist. All of your guests will appreciate this. We hope this post gave you options for different dishes to use in planning your menu as well. Visit us again on Monday for ideas to set your table and entertain in style.